I attended my first CaboPress last month. On the same US-Mexico trip, I also attended and spoke at two WordCamps – Ann Arbor and New York City. I covered my WordCamp Ann Arbor and New York City experience in another post here. Now over to CaboPress! ? To start with, calling CaboPress a “conference” is unfair to it! It is more like a crash course in business management and strategy. In the short span of 5 days, I learned so much that would otherwise take years. One of the favorite parts about CaboPress is the structure of the sessions. You might already know that all the CaboPress sessions happen in a swimming pool. But there is more to it! CaboPress sessions are more like group discussions led by a speaker. Below are my few key takeaways from CaboPress 2017. The first session was on setting product roadmaps and was lead by Chris Lema himself. Rapid growth opportunity and amount of control that a product can provide are sometimes hard to resist. But Chris spoke about is the viability of products, and how we sometimes need to set aside our emotions and have an objective perspective on situations. My takeaway – If a product is not growing, it’s a failure! As always, he brought the session to life with his natural story-telling ability. Others in the pool added valuable lessons from their own experiences with products. Another session that I attended was about generating Recurring Revenue for Services, lead by Karim Marucchi. I found the part where he spoke about how he runs and manages CrowdFavorite’s different verticals particularly helpful. In fact, I have already implemented some KPIs based on things I learned through this session at rtCamp. The new reports helped me understand profitability across departments and business units much better. The learning opportunities didn’t end with the sessions in the pool. Every day started with breakfast with an open networking opportunity. Unlike lunch and dinner, breakfast has no set topic or groups. For lunch, everyone was assigned to a group of 4-6 people that ate together every day. My lunch group, which remained same every day, included Anil Gupta (MultiDots), Aleksander Kuczek (Perfect Dashboard), David Payette (Payette Forward), Chris Badgett (Lifter CMS) and Zach Skaggs (from Ninja Forms). The group was a great mix of people across products and services. I found out that some of these product folks initially started their journey as services agencies. I could relate to a lot of what was discussed and also learned a lot from their transitions. 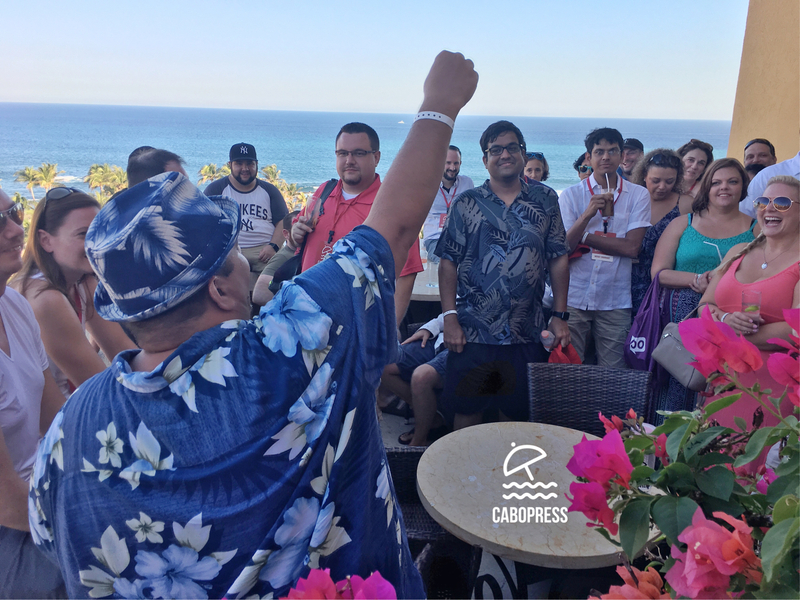 For dinner, groups were formed based on criteria such as product versus services people, first-time attendees versus CaboPress veterans and so on. Each day, we were given a topic to talk about. Topics included our origin stories, our plans to double revenues in the coming year and the one thing we will implement on getting back home. You can see my first evening dinner group in the picture below. I just realized that have very few pics from CaboPress. Thanks Mendel for this one though! Even after dinner, people bonded over coffee & cigars, at beach or poolside. For me atleast, the learning only stopped at the time of sleeping! The thoughtful organization of meals helped me make the most out of my time at CaboPress, and come back pumped and refreshed. This post is just an excerpt from what I learned at CaboPress. I haven’t even mentioned the great sessions in Business Automation by Jennifer Bourne, eCommerce Hacks by Syed Balkhi and an epic session on Selling Your Company by Tony Perez. For various reasons, Sujay Pawar and I were the last to send our arrival details to Chris for CaboPress. Looks like I am the last to write about CaboPress! It has been more than two weeks since I attended it but I still occasionally remember something from a session or a random conversation and the bulb lights up! ?